Today’s post looks at what I consider to be one of the most important interpreter training resources to come out in recent years. 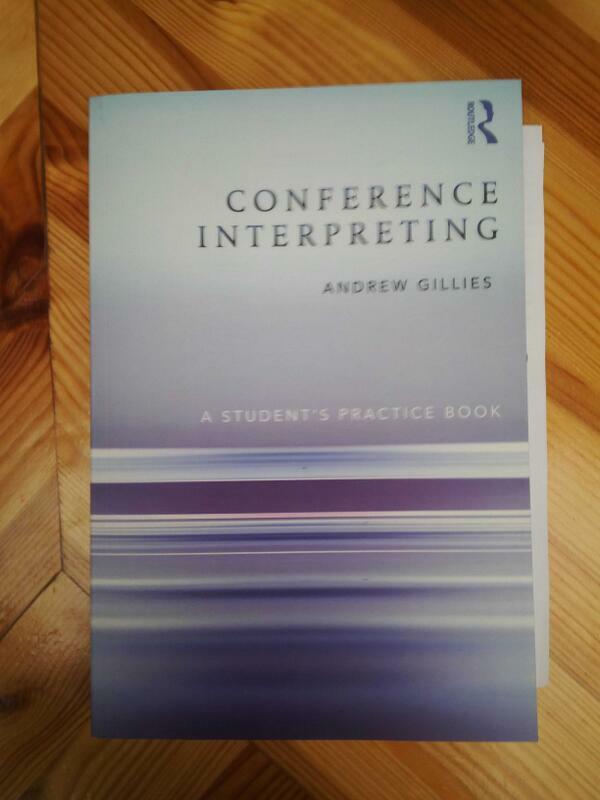 It was my intention to write this review of Andrew Gillies’ new book, entitled Conference Interpreting: A Student’s Practice Book (Routledge, 2013) when it was first published last spring, but life had other plans for me, and so it is only now that I am finally able to sit down and tell readers what I like so much about it. For those students and trainers who haven’t yet had a chance to get their hands on a copy, let me just give you a brief idea of what you’ll find inside. As the title implies, Gillies’ new book is meant to help guide students as they practice their budding interpreting skills. It offers a compilation of over 300 different exercises targeting various aspects of the interpreting process. The exercises, which have been taken from a wide range of sources (all duly cited), are grouped into four main parts (A: Practice, B: Language, C: Consecutive Interpreting and D: Simultaneous Interpreting), and each of these parts is further divided into several sections (active and passive language enhancement, delivery, reformulation, split attention, etc.). 4 Learning can (and should) be fun! Let me illustrate how Gillies’ new book promotes learning along these principles. Let’s say that we’ve got a couple of students having a hard time with their delivery in simultaneous: they’re speaking in a very monotonous voice, hunching over, and mumbling into the microphone. We’ve told them to liven it up a bit, asked them to record themselves and listen to their own performance, even suggested they place a little sticky note on the booth’s glass saying “DELIVERY!” or “KEEP IT LIVELY!”, but nothing seems to be getting the message across. So we turn to Gillies’ book for some new ideas on how to encourage these students to communicate better in the booth. We flip to Part D: Simultaneous Interpreting, find the section on Delivery, and lo and behold, there’s not one but six new exercises to try. We decide to go for exercise D.2 Inverted conference, where Gillies suggests running a mock conference where the speakers sit in the booths and the interpreters sit at the main table. The idea is to demonstrate the simultaneous interpreting is also a communicative act, and that behaviour that would not be appropriate for someone speaking before a group – speaking in a monotonous voice, hunching over, mumbling – is also not appropriate in the booth. It’s the perfect exercise: it’s targeted (on communication skills), the impact is immediate and measurable (in the form of audience feedback), the students are bound to take the lessons learned back with them into the booth, and, last but not least, it’s probably quite fun. At this point, you may be wondering why it’s called “A Student’s Practice Book”, when all I have been doing is explaining how trainers can use it. I guess that just reflects my own personal bias – I see it first as a resource for trainers like me. But of course, students will also be able to make use of the ideas covered in the book. In particular, advanced students of interpreting will find plenty of ways to structure their group practice sessions and lots of new ideas to keep themselves and their classmates motivated. Beginning students, for their part, will want to read the sections on practice and feedback as early on in their training as possible. It should be made clear, however, that the book is not a manual, to be read from start to finish, that will teach the absolute beginner how to become an interpreter (for that, you’ve got Gillies’ other main title, Note-Taking for Consecutive Interpreting: A Short Course (St. Jerome, 2005), which offers a step-by-step guide for beginners on how to develop a workable note-taking technique). Rather, Conference Interpreting: A Student’s Practice Book is a wide-ranging, diverse compilation of resources that students and trainers of all levels will want to have on their bookshelf and consult as the need arises. As I see it, Gillies has spared us all the trouble of having to sort all those loose papers we’ve gathered over the years, all the photocopies we’ve received from training seminars, all the ideas we’ve scribbled on sticky notes after conversations with fellow trainers over coffee, because he’s just gone and done it for us. For this reason alone, I consider the book to be a major contribution to interpreter training. The added bonus in my case is that it has also allowed me to add some variety to my own training approach. After many years in front of a classroom, one runs the risk of falling into a rut and, worse, losing enthusiasm for the training experience. Thanks to Conference Interpreting: A Student’s Practice Book, it doesn’t look like that will happen to this trainer any time soon. *For an excellent take on Gillies’ book, check out Barry Slaughter Olsen’s review “One Interpreting Practice Book to Train Them All”, published on the InterpretAmerica website. Reblogueó esto en Andrea Barrocal Translation. As an interpreting student, I really find this book very interesting. It is a different reading about interpreting, not a conventionalt theor. Gillies knows which exercises we, the interpreting students, can practice in order to adquire the necessary skills for the task of interpreting.